Lesley Downer visits the new exhibition at the Van Gogh Museum, Amsterdam. ‘All my work is based to some extent on Japanese art,’ wrote Vincent Van Gogh. 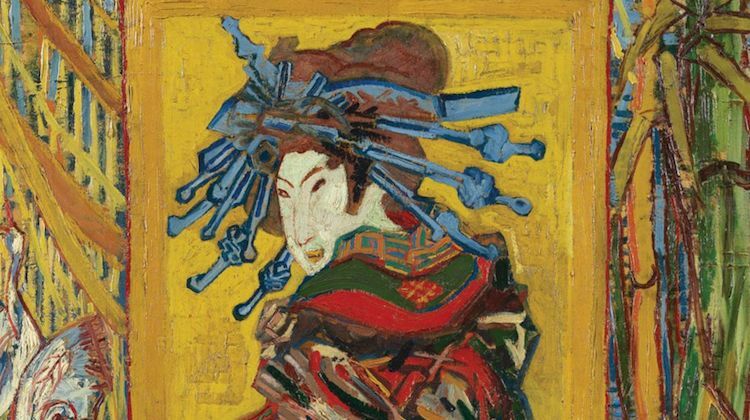 This absorbing and beautiful exhibition at the glitzy Van Gogh Museum explores Van Gogh’s fascination with Japanese art and with Japan – you could almost call it obsession – and the ways in which it profoundly influenced his art. It’s well worth making the trip to Amsterdam – especially in the new Eurostar that goes at least one way non stop – to see it. It makes us look afresh, not only at the artist’s works, but at the Japanese woodblock prints which inspired them. During the winter of 1886 to 1887 Van Gogh bought more than 600 Japanese woodblock prints from the Paris art dealer Siegfried Bing. At the time half the western world was afire with Japonisme, wild enthusiasm for Japanese arts and crafts, and Van Gogh, strapped for cash, planned to sell them. In the end he didn’t manage to sell any. But as he sorted them out he was transfixed by the compositions and colours, the strong lines and extraordinary perspectives which were startling and fresh to western eyes. He started off by copying three prints – a courtesan by Keisai Eisen from the cover of Paris Illustré (shown above), and two landscapes by the great master Ando Hiroshige. 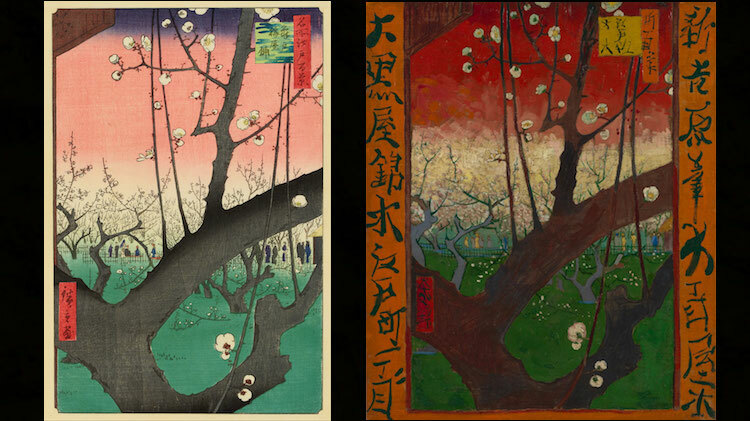 It’s fascinating to see the clean cool lines of the Japanese prints alongside Van Gogh’s vigorous renditions. The images are very similar indeed – Van Gogh has copied them with a great deal of care – but the final effect is utterly different. While the originals are delicate, spare and serene, Van Gogh’s versions are earthy and impassioned, with thickly textured surfaces painted with feverish brush strokes. He surrounds his courtesan with bamboo, cranes, frogs and water plants and even tries to imitate the crêpey texture of the Japanese paper. The Amsterdam exhibition occupies three floors and includes a very generous selection of Japanese prints – not only the specific prints that influenced Van Gogh but many others, to give a flavour of this aesthetic that was of such importance to the artist. Van Gogh quickly moved on from simply copying. Painting the Paris art dealer Pere Tanguy, he fills the background with Hiroshige’s depictions of Mt Fuji, bamboo and birds, and Eisen’s famous courtesan. He even gives Pere Tanguy slanted eyes. But after two years in Paris he had had enough of the hustle and competitiveness and in 1888 headed south. He took a few favourite prints with him, colourful cheerful depictions of landscapes and women. He yearned to go to Japan and as he travelled gazed out of the train window, wondering ‘if it was like Japan yet.’ He hoped at least to find a similar light and colour in the sunny south. Inspired by Japanese art Van Gogh’s work radically changed, becoming far more vigorous and dramatic. He adopted bold Japanese contour lines, played with extraordinary perspectives, unusual viewpoints and prominent diagonals, applied bright flat areas of colour and focussed on tiny details of nature. It seemed to liberate him from the constraints of western painting, helping him to abstract further and further from reality. ‘After some time your vision changes, you see with a more Japanese eye, you feel colour differently,’ he wrote to his brother Theo in June 1888. The exhibition focuses largely on the works which Van Gogh produced at Arles between 1888 and 1890. There is The Yellow House (shown above) set against a flat blue sky almost more solid than the house; the famous depiction of his bedroom and yellow bed using ‘flat plain tints like Japanese prints,’ with strong outlines, flat colour planes and no shadows; The Sower, with the dramatic diagonal of the plum tree silhouetted against a huge yellow sun; and the rugged Rock of Montmajour alongside Hiroshige’s print of the soaring crags at Hakone. There’s also Van Gogh’s gorgeous painting of almond blossom seen against an intense turquoise sky (shown below) and his portrait of L’Arlésienne who to him symbolised southern France, just as the courtesan stood for Japan. Placing these works side by side with the prints which inspired them casts light on even the most familiar of these well-loved paintings. But it wasn’t just the art. In Arles Van Gogh hoped to adopt what he saw as the Japanese way of life. He pictured woodblock print artists as humble artisans who lived and worked together in harmony like monks in a monastery and decided to set up an artists’ colony with his friend Paul Gauguin as the leader. Like Japanese artists, they exchanged self portraits. In the portrait he sent Gauguin he depicts himself as a shaven-headed Japanese monk with slanted eyes. But as we know it didn’t work out. The collaboration with Gauguin came to an end, the artists’ colony fell through. Van Gogh cut off his ear, checked himself into a hospital and painted feverishly, producing a painting a day. When he couldn’t go outside he painted through the bars of his window. The last part of this absorbing and fascinating exhibition puts us right inside Van Gogh’s studio, surrounded by all the Japanese prints that he had pinned to the wall – unframed, working tools, some torn and paint-stained. He comments often on the cheeriness of the brightly-coloured prints of landscapes and beautiful women. Perhaps he also hoped to find peace of mind by surrounding himself with such serene images. But alas, that was the one thing he was destined never to find. Van Gogh and Japan at the Van Gogh Museum, Amsterdam, continues till 24 June 2018. Lesley Downer‘s latest novel, The Shogun’s Queen, is now out in paperback. For more see her website, lesleydowner.com. The Plum Garden in Kameido (from the series One Hundred Famous Views of Edo) by Ando Hiroshige (1797 – 1858), 1857. (wiki commons) shown next to Flowering Plum Orchard (after Hiroshige) by Vincent Van Gogh, 1887. Almond Blossom, Van Gogh 1890.